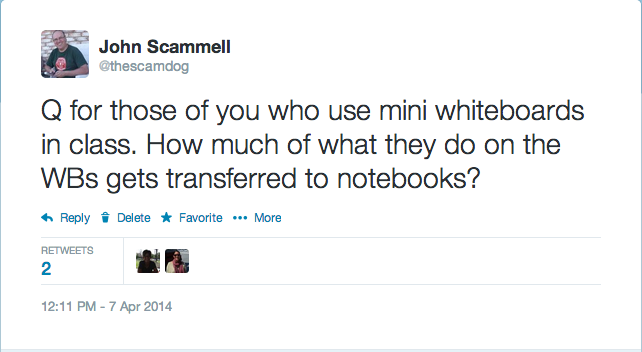 Recently, I tweeted out a link to Nat Banting’s post on whiteboards. It reminded me that I was going to write a post here about my experiences with them this year. I’ve been trying them out. I’ve done some things well. I’ve learned some things. How their work “pops” off the boards so that I can see it easily. As I circulate, it’s so easy to provide feedback. How comfortable students are working on a dry-erase surface. They are not afraid to try things. They are not afraid to make mistakes. How easy it is to group and pair students to give and receive feedback from peers when their work is on whiteboards. The things I learned, I learned by making mistakes, and by asking you questions. Here’s one I threw out in the middle of a class in which I was making mistakes. I was having students do questions on the whiteboards, and then copy them into their notebooks. Of course, they hated it. They were doing everything twice. The high school math teacher in me is having a hard time letting go of the mentality that I must write it on the board and they must copy it down, or they haven’t learned it. I still want them to leave my class with something useful and correct written down in their notebooks for future reference. Please don’t judge me for that. In the middle of that class, I put the call out on Twitter. The responses were immediate and helpful. Talk about real-time formative feedback! My pocket was buzzing in the middle of the lesson. You can see all the responses here. Christopher Danielson (@Trianglemancsd) saw right to the heart of my question and threw back at me, “Also, how much needs to?” That’s really what I was wrestling with. Consensus was that between none and very little of what is written on whiteboards gets transferred directly elsewhere. This whiteboard work is the learning phase. It’s messy. It’s getting transferred to their brains, honest. One suggestion what to have students take a photograph of their work if they think they will need to look back at it. Frank Noschese (@fnoschese) suggested Lens Mob as a way to create an album they could all send their work to. Jacqueline (@_Cuddlefish_) uses them a lot, and I respect her experience. I wish she blogged (too busy geocaching, I suspect). She tried to convince me to let go of the need to have stuff written down. So the question, then, becomes what do they do AFTER they have finished the messy learning on the whiteboards? Some teachers go straight into practice. Nat Banting (@NatBanting) and Bowman Dickson (@bowmanimal) talk about having students reflect on their whiteboarding at the end. One teacher I work with this year helps her students summarize a few key things in a “Student Study Guide” that she provides. Heather Kohn (@heather_kohn) does something similar by giving her students a guided notes page for things that she feels need to be formalized. Of course, there’s always the textbook for future reference. I’m in the middle of figuring out what I am going to do next year. If I land back in a classroom, I will make sure I end up with a set of mini whiteboards. I may still make kids write some stuff down on paper. Don’t hate me for that. I take no credit for this idea at all. I was in a classroom this morning, and the teacher had the students play a game of Radical SNAP. The students were totally engaged, and were enthusiastically converting between mixed and entire radicals. It’s pretty simple to set up. Pair off the students in your class. Each pair gets a deck of cards, and should remove the 10, J, Q and K. Shuffle the remaining cards, and deal them so that each person has half the deck, face down. The students flip over their top cards. The student on the left puts his in front of the radical, and the student on the right puts hers under the radical. The first student to correctly convert the mixed radical to an entire radical wins the round. 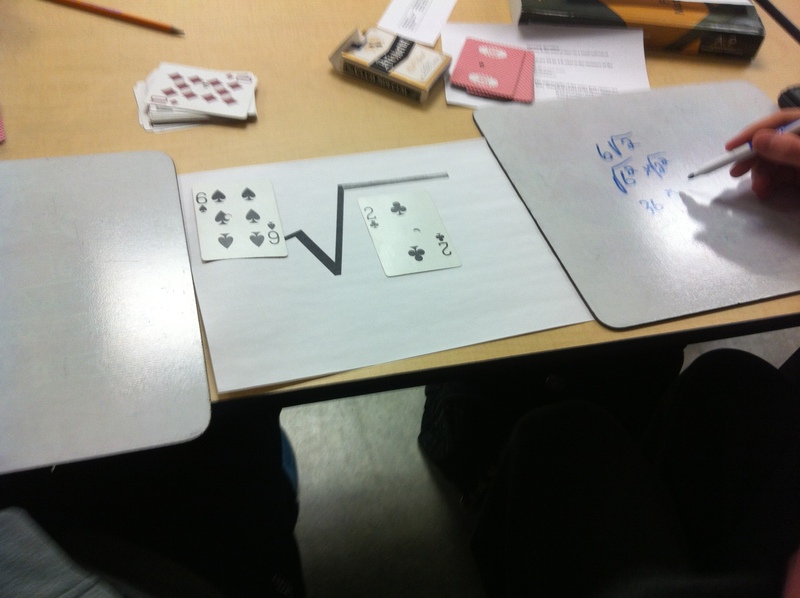 The students flip over their top cards, and put them both under the radical. The first student to correctly simplify the radical or to identify that it can’t be simplified wins the round. In the spring, I was working on a series of posts about formative assessment in math class. I got sidetracked by starting a new blog, and kind of let it drop. This morning, however, I read this great post from Max Ray about questioning, and it brought me back to formative assessment. There are two good reasons to ask questions in classrooms: to cause thinking and to provide the teacher with information that assists instructional decision making. Max is right. Good questions that cause thinking in math are tricky. Most of us lean towards asking recall and simple process questions. With practice, we can learn to throw out deeper questions as easily as we ask recall questions. Questions like the two above feel safe to students. They don’t have to worry about being wrong. They can think and respond without fear. Sometimes, questions can be improved by turning your lesson around. I spoke to a teacher last year who was working on 3-D shapes with his class. He had the nets all copied and ready to have the students cut out, fold, and tape. It seemed more like a lesson on cutting, folding and taping, so he scrapped it. Instead, he brought out models of the 3-D shapes, and asked the students to create the nets that could be folded up to make the shapes. It ended up being an incredibly rich discussion. The more we can engage students in conversation with each other through effective questioning and planned activities, the more likely they are to come to their own understanding of the topics. I’ve been writing here about getting students to practice in class. Many of our students don’t (and probably shouldn’t) be doing practice math questions at home. We need to build opportunities into our lesson for them to do some questions. Kate Nowak has provided us with two great ways to get students to practice some questions in class in more compelling ways. This practice is formative assessment. I would classify both of her activities as activating students as instructional resources, using the language of Dylan Wiliam. I have nothing to add to Kate’s work, other than to tell you I’ve used this stuff and it works. I’m just pointing you in its direction and making a link between what she has shared and the formative assessment I’ve been writing about in my recent posts. Check out Kate’s Row Game and Speed Dating. She has several already prepared that fit our WNCP curriculum. It looks like she has been collecting other people’s Row Games here. 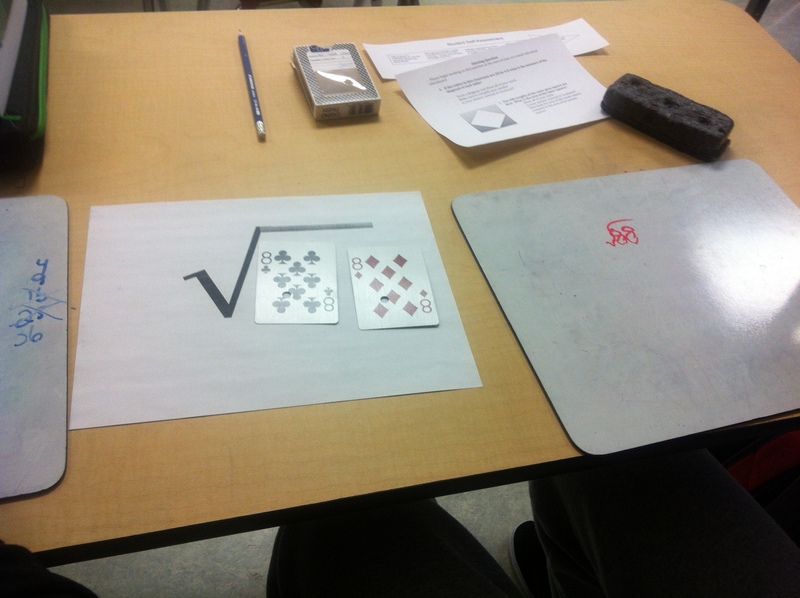 Both activities are easily differentiable, and allow kids to practice their math. They have built in accountability because students are responsible to each other. They are both fine examples of embedded formative assessment. An earlier post discussed how to use exit slips as practice. A great way to activate students as owners of their own learning (another of Dylan Wiliam’s 5 key strategies) is to use exit slips to have students self-assess. I was in a classroom last week where the teacher had prepared a review activity for his Math 20-1 (Pre-Calculus 11) students on radicals. He prepared 5 stations and had the students set up in groups. He chose to group them so that each group had a blend of abilities. The three groups at the front of the room completed station 1 (converting from entire radicals to mixed radicals) while the three groups at the back of the room completed station 2 (converting from mixed radicals to entire radicals). Each station contained an envelope with 6 questions of varying difficulty. After a few minutes, when students were done, the groups got up and switched stations. Once they had done stations 1 and 2, the entire class did station 3 (adding and subtracting radicals) simultaneously. Groups that finished were instructed to get up and circulate and help those that hadn’t finished. Once the class was done station 3, they split up again. 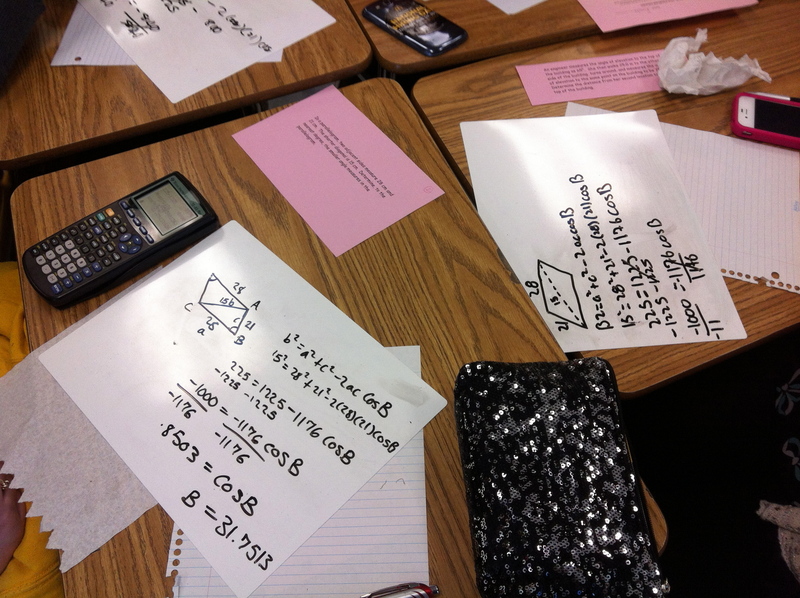 The front of the room did station 4 (multiplying radicals) while the back did station 5 (dividing radicals). Once completed, they all got up and rotated to the last station they had left. The 4’s moved to 5 and vice versa. This is a nice, non-worksheety way to have students complete some practice before a summative assessment. It allows students to converse and help each other (feedback and activating students as instructional resources as defined by Mr. Wiliam). The teacher greatly enhanced this activity by making students owners of their own learning with an exit slip. He prepared an exit slip for them to track their progress through the 5 stations. As they completed each station, students self-assessed as Excellent, Satisfactory, or Limited. Based on their self-assessments, they left the class knowing exactly what, if anything, they still had to work on before the summative test. This use of exit slips is an effective way to activate students as owners of their own learning. It allows them to articulate precisely where they are still struggling. The resources used in this lesson can be accessed below. Video of the lesson in action is posted on on the AAC website. I take no credit for this one and I’ve never tried it. It’s all Rick Wormeli. He shared this strategy in a session I attended several years ago. It would certainly qualify as activating students as instructional resources for one another. Rick works with one student a day ahead of the next lesson. He makes sure that student understands what is going to be taught the next day. That student becomes the “expert” on the material during the next day’s lesson. Students who have questions are expected to go to the expert first. Simple. Shortest blog post I ever wrote. This strategy would be effective in showing students that support and help doesn’t always need to come from the teacher. Remember, formative assessment is about feedback. That feedback doesn’t always need to come from the teacher. Rick has a great story about what he does when it is a weak student’s turn to be the daily expert. I won’t ruin it for those of you who haven’t seen him yet. And if you haven’t, I highly recommend him. He’s an engaging and compelling speaker. In math class, the only things my students get back with grades on them are summative assessments. I have significantly reduced the number of summative assessments I use in high school math classes. Most courses are adequately covered with 5 to 10 well constructed summative assessments. Everything else goes back to the students with comments only. The feedback I provide instead of a grade varies by student needs. Some students simply need me to circle the place in a problem where they started to go wrong. Those students can take it from there and correct their work with little direction from me. Others need some comment on what the next step might be. I try to provide as little scaffolding as I can get away with, while still letting them have enough to move forward. It’s a fine line. I want them to take ownership without me giving them everything. I don’t spend a lot of time on written comments. Most of the time I look at things quickly and arrange my class so I can talk to the students personally, as I described in the previous post. Those kind of groupings also allow students to get feedback from each other instead of just from me.